As regular readers of this blog know, I am currently playing around with NFC on Windows Phone 8. I peeked a little in the Bluetooth app to app sample at MSDN to understand how to find a ‘peer’. A peer is defined as the same app, installed on a different phone. So basically you go around installing the app on two phones, start it on phone 1, make sure it calls PeerFinder.Start(), tap the phones together and presto - the popup as displayed in the image on the right appears. If you check ‘open app’ – or whatever it shows in the language you have selected – the app is started on the second phone as well. Annoyingly, the OnNavigatedTo event is only available inside the page’s code. If you want to handle this the MVVM way, you want this to be taken care of by a view model or a model, not by the page’s code behind. and I trust you can take it from there ;-) . Be aware the events generated are generated outside the GUI thread, so if you try to data bind properties changed from the event method, you might run into cross thread access errors. Deployment.Current.Dispatcher.BeginInvoke is your friend, then. This is not about code, but about something a fellow developer and blogger told me, which made me quite sad. It’s a kind of personal rant, so feel free to skip it if you are looking for code. In 2007, after a frustrating search on the internet for a complete and working code sample for whatever it was, I was quite pissed off. And I decided “well if apparently people are too lazy or too much ‘look at me’ superior to post complete and working samples, I will start doing so myself”. I also could have gone to the blogs I visited posting comments like “you moron, this code is incomplete and/or wrong” or “why don’t you stop coding/blogging the cr*p you post is useless”. While technically I would have been right, I don’t think it would have helped me solve my problems. Starting blogging myself did not help me solve that problems either, but at least I had a place where I could dump my own solutions for later reference. Very handy. Apparently other people liked it too. I was lucky enough to post a few good articles, and a few very dumb ones too, but those were met with “hey, that’s obsolete”, “hey, this is a better solution” or “I think you are missing a few steps” – with links and information. I either did take the articles down, or reworked them with the new information. I was lucky enough not to get lambasted, flamed or receive abusive comments or mails – no, my baby steps were encouraged by a few people – mostly MVPs by the way – who kind of nudged me along the rocky path of the beginning blogger. That encouragement made me go on, becoming confident enough so that when the occasional abusive comment arrived, I was able to ignore the wording of the comment and fix the error, or challenge the commenter: “so if you are such a know-it-all, why don’t you blog about it - why do you leave me stumbling in the dark making stupid avoidable errors?”. I recently talked to the beginning blogger I mentioned before, who was severely flamed in the beginning of his ‘career’, and he almost quit blogging of that. The wording I use in the second paragraph are more or less quotes of what he received. This is really very counterproductive behavior. If you are someone who likes to demonstrate his/her knowledge on someone else’s blog by making demeaning remarks – realize what you are effectively doing is extinguishing enthusiasm that may have grown into the creation of a vast information resource. You are killing creativity, stomping out the sharing flame, making one of the very few willing to take time to share knowledge retreat into his/her shell, maybe never to come back again. Flaming other people’s blog has never led to more examples and information. If you want more and better examples: stimulate and encourage where you can, correct if you feel you must, and try to behave like a civilized human being. And above all, start blogging yourself. Don’t be a prick – share. Use your knowledge to improve people, not to tear them down. That’s community. That’s how it works. Currently I am working on a Windows Phone 8 action game in which you can fight a kind of duel. This involves pairing the phones via NFC and then obtaining a socket trough which the phones can exchange game information. Liking to steal from examples myself (why do you think I name my blog this way, eh?) I stole code from the Bluetooth app to app sample at MSDN. Now this is a great sample but it has one kind of problem for me. From the debug statements in this code you can see things weren’t exactly working as planned. Now the way this is supposed to work is as follows: as the opponent sends a message using SendMessage, the other phone is receiving a message via the socket in GetMessage. The first four bytes contain an unsigned integer containing the length of the rest of the message – which is supposed to be a string. I noticed that while things went off to a good start, sooner or later one of the two phones would stop receiving messages or both games crashed simultaneously. I got all kind of null value errors, index out of range and whatnot. When I started debugging, I found out that while the app on phone 1 said it sent a 3-character string, the receiving app on phone 2 sometimes got a huge number for the message length, that obviously wasn’t sent, it read past the end of the stream – crash. The MSDN sample works fine, as long as it is used for the purpose it was written, i.e. sending out (chat) messages at a kind of sedate pace – not for sending a lot of events per second to keep a game in sync. The essence of a stream is that it’s a stream indeed – things have to be written and read in the right order. For what happened of course was a race condition between two or more events in a short timeframe. The first event wrote the message length, the second event as well, then possibly a third, before the first one came to writing the actual message, and whatever arrived on the other phone was a garbled jumble of bytes that did exactly reflect what happened on the sending phone, but wasn’t the orderly message length – message payload stream the other phone expected. Note you have to remove the “await” before the StoreAsync methods as those are not allowed within a lock. This method makes sure one message – and the whole message – is written on the stream and nothing comes in between. Update – the first version of this posting contained a small error – which has been graciously pointed out to me by a few readers (see comments section). Also, I’ve been pointed to an article by Scott Hanselman about a similar subject. I’ve tried using the AsyncLock by Stephen Toub he describes but found out that although it works very good and my game does become a bit more fluid, the lag in getting messages across is a lot higher. Net effect: while the game runs more smoothly on both phones, the game state actually gets out of sync very fast, making the game unplayable. Apparently the AsyncLock approach doesn’t work for high speed continuous message exchange, so for now I’ll stick to the approach I described above. This week my fellow MVP Scott Lovegrove contacted me and asked if and how he could pass the result of an event to my WinRT EventToCommandBehavior and/or EventToBoundCommandBehavior. I replied this was currently not supported, but that would not be hard to make. He acknowledged that, and asked if he could mail some code. Since I am not very possessive of ‘my’ libraries, and am a lazy as any programmer should be, I responded with giving him developer access to Win8nl. He actually took up the challenge, and submitted the code. This will write '”Mouse”, “Touch” or “Pen” in your output window, depending on what you use to tap. Of course this is not a very useful application of this technique, but it proves the point. If you don’t use PassEventArgsToCommand both behaviors will work as before. If you value your sanity, do not, under any circumstances, pull in Reactive Extensions from NuGet into a Windows Phone 8 application. Use the built-in Microsoft.Phone.Reactive.dll instead. Those who follow me on twitter may have seen a few tweets pass by over problems I had with the Windows Phone 8 version of my app Map Mania. The submission went OK the first time, but the test team found two bugs – bugs that were also there in previous versions, but apparently they have ramped up the quality bar again. I can only applaud that, even if I got bitten by it myself, because the test report was comprehensive and showed someone actually understood or had read into some issues that may arise when using WMS services – and by doing so, succeeded in crashing my app. We weren't able to process the app submission for Map Mania. Unfortunately, something happened with your Windows Phone app submission. Check the status of the submission in your app list at https://dev.windowsphone.com/applicationlist. If the problem persists, contact support for assistance. There are duplicate files in AppManifest.xaml. Remove one of the files and then try again. If rebuilding your XAP doesn't solve this problem, you may have to manually remove any duplicate files from the AppManifest.xaml in your XAP file. To rebuild your app, see Rebuilding your project in Visual Studio. My friends, I have rebuilt the app till my fingers bled, cleaned the solution, then removed all the binaries manually, to no avail. Then I opened up the XAP to look for duplicate assemblies – there weren’t any duplicates; I scanned the AppManifest.xaml till I saw cross-eyed and didn’t find any duplicate entries there either - and after the 10th or so submit followed by automatic mail error within five minutes I gave up and indeed contacted Support. I won’t go into full detail, but I think it’s fair to say this problem wasn’t easy to solve and Support struggled as much with it as I did. Quite some mails went back and forth, and the 9 hour time zone difference didn’t exactly work favorably for a quick resolve. It wasn’t until our Dutch DPE Matthijs Hoekstra, who I think now owe not only my sanity but possibly also my soul ;-), queried his sources and got back that a post-processing error apparently was being caused by System.Reactive.Core.dll and I was recommended to use Microsoft.Phone.Reactive.dll instead if possible. I finally had a possible smoking gun - my own port of the #wp7nl library pulls in Reactive extensions from Nuget. So I removed the dependency from the library package, made a new local build, installed that into the app, compiled, uploaded and submitted, waiting for the inevitable dreaded 2001 error mail to pop up. Over an hour later, the only mail I got was from outlook.com reminding me of a birthday and the app status at the moment of this writing says “Status: In signing stage". Hallelujah! Now I don’t understand why submission went OK the first time and not the second time around. But I am very glad the issue is resolved. If you use my library, please remove the references it makes to the external reactive stuff manually or wait for me to publish the version that will do without. It will be out soon, I can tell you that. Update: #wp7nl was updated within a few hours of this post. If you use the Windows Phone 8 version, please update to 3.0.1. Should you experience problems with missing assemblies, make a manual reference to Microsoft.Phone.Reactive.dll to the projects that use wp7nl. And please remove any reference to Rx* should they linger along. Some time ago I posted a WinRT behavior to mimic EventToCommand. This behavior cunningly looked for the command name in the DataContext, but it occurred to me (and some blog post commenters as well) that it actually might be more logical skip all that skullduggery and let the developer bind to a command in stead of letting her/him provide its name as string and then go look for it. Anyway, not wanting to break compatibility I added a new behavior to my win8nl library on CodePlex, very originally called EventToBoundCommandBehavior. Which goes to show that you can be too clever. I this case, the programmer has lost track of what’s the exact data context. Happens all the time, even to me. I’ve used colors to depict the data context changes. In the blue code, a single Phone is the context. Full working example can be found here. When I accepted the invitation from MADNbe to talk about Maps and MVVM on September 20 early in the summer (or what was supposed to be the summer) of 2012 the actual release date for the Windows Phone SDK 8.0 was still a mystery. As it gradually became clear the SDK would not be available at the date my talk was scheduled, I devised a plan B and in stead talked about Windows Phone 7 mapping and how to port this code and knowledge to Windows 8. I also wrote a blog post I wrote about it. Now the funny thing is - the Windows Phone 8 mapping control and the Windows 8 Bing Maps control show some remarkable similarities. So if you read this article and think “Huh? I’ve read this before” that’s entirely possible! So world in general, and Belgium in particular, meet the new Hello World, Windows Phone 8 style! Not going to happen - I am not going to repeat myself for the sake of content ;-). In the the Windows 8 article I give a short recap of how you can bind to a Windows Phone 7 map, using templates. I’d suggest you read that if you haven’t done so already ;-). By the way, the sample solution contained with this project is mostly the same as the sample Windows Phone 7 application I use in my talk. I upgraded to Windows Phone but did not even bother to change the libraries I used. (like MVVMLight, Phone7.Fx or my own wp7nl library). That’s still Windows Phone 7 code and you call that code from Windows Phone 8 without any problem. Very soon I hope to publish updates for the libraries specific to the platform, and you will see them appearing in your NuGet package manager. The only thing you have to keep in mind is that the app no longer runs in quirks mode once you upgraded to Windows Phone 8. That means – if your library code does something funky that has a different behavior under Windows Phone 8, the platform is not going to help you keep that funky behavior - unlike when you run a (real) Windows Phone 7 app on it. Without cheering overly loud for ‘my’ home team, I actually think the Windows Phone mapping team actually has done a better job on this part than their Windows 8 brethren. That’s actually not so very hard, as the Windows 8 Bing Maps control does not support data binding at all. 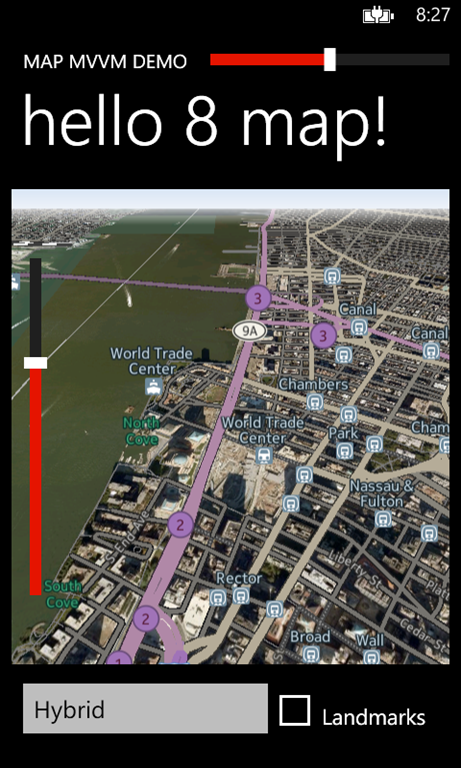 The Windows Phone 8 control actually (still) supports the binding of Center and ZoomLevel, as well as the new properties CartographicMode, LandMarksEnabled, Heading and Pitch, – “Heading” being the direction of the top of the map, default 0, being North – and Pitch the viewing angle of the map (normally zero, or ‘straight from above’). And probably some more I haven’t used yet. The shapes the control draws cannot be templated. They are apparently just projections of something native (as is the map itself). There are only two kinds of shapes: MapPolygon and MapPolyline, both descending from MapElement (as opposed to MapShape in Windows 8), which in turn descends from DependencyObject – so I can use the same trick again – storing data in attached dependency properties. To solve this, I use the same approach as I did in Windows 8: apply behaviors. Only that’s a lot easier now because unlike Windows 8, Windows Phone 8 supports behaviors out of the box. The only difference, in fact, with the Windows 8 behavior is that there is not a TapCommand property but an EventMapper collection. That is because unlike the Windows 8 map shapes, Windows Phone 8 shapes don’t support events at all. These are events of the map. There aren’t any layers for shapes too – there is just a MapElements collection that you can add shapes to. Which property in the item view model contains the Path – this is the terminology for a MapElement collection of points. This is of type GeoCoordinateCollection. A drawer. A drawer is a concept I made up myself. It’s a class that creates a shape from a collection of points contained in a GeoCoordinateCollection. It’s my way to make something that’s not templatable more or less configurable and the idea behind is exactly the same as for Windows 8. What command in the item view model (in this case, a RoadBlockViewModel) must be called when a GestureEvent is called on the map. This can be either Tap or DoubleTap. You do this by adding an EventToCommandMapper to the EventToCommandMappers list. The basic drawers don’t do anything with the view model: they just take the settings from XAML. You can write your own if you want for instance return a shape of a different color based upon view model values. Thematic mapping again, just like I said last time. If you just want to use the behavior, download the sample solution, rip the Wp8nl.Contrib project from it and use it. It just needs a reference to System.Windows.Interactivity.dll, that’s about all. So this works fundamentally different from it’s Windows 8 counterpart: not the shapes respond to events, but the map does so, and reports the shapes found at a location of the tap or the doubletap. The shapes in question can be retrieved using the map’s GetMapElementsAt method. And then I select the first shape I find that has the same layer name in it’s LayerName attached dependency property as the behavior. Note this filter is necessary: the map reports the shapes and it reports all of them - since there is no real layer structure the map has no notion of which behavior put the shape on the map. And you don’t want every behavior reporting all other shapes that happen to be on the same location as well – that would result in double events. But if the behavior finds a hit, it calls the FireViewModelCommand, which is essentially the same as in Windows 8, and it shows the window with alphanumeric info. That part has not been changed at all. The rest of the behavior is mainly concerned with adding, removing and replacing shapes again. I would suggest you’d study that if you are interested in how to respond to the various events of an ObservableCollection. To prove that data binding actually works, you can open the menu and select “change dhl building”. That’s the most eastward building on the map. If you choose that, you will actually see the building change shape. The only thing the TestChangedShapeCommand command - that’s called when you hit that menu item – does, it change a building’s geometry property. The image on the map is updated automatically. Somewhere down in the guts of Windows Phone 8 there’s a native control, and I very much think both it and it’s Bing Maps control for Windows 8 counterpart are of the same breed. Both have similar, yet subtly different projections to managed code. As I already mentioned – in Windows 8 the shapes descend from MapShape, in Windows Phone 8 from MapElement. In addition, Windows Phone Map Elements support StrokeColor, StrokeThickness and StrokeDash – no such thing on Windows 8 - one more cheer for the Windows Phone team ;). But neither are supporting complex shapes and things like donuts (polygons with holes in it). These are the hallmarks of the real heavy duty GIS systems like the stuff Cadcorp. ESRI et al are making. In Windows 8, shapes are created from a LocationCollection which is a collection of Location. So both platforms refactored the Locations and their collection, and both in opposite ways. This can be solved by using converters or a generic subclass specific for both platforms but I leave things like that as exercise for the reader. The fun thing is: once again it shows that a lot of code can be reused as long as you keep application and business logic in models and view models – that way, you only have to deal with user interface and platform considerations, but your basic app structure stays intact. Once more: three cheers for MVVM. 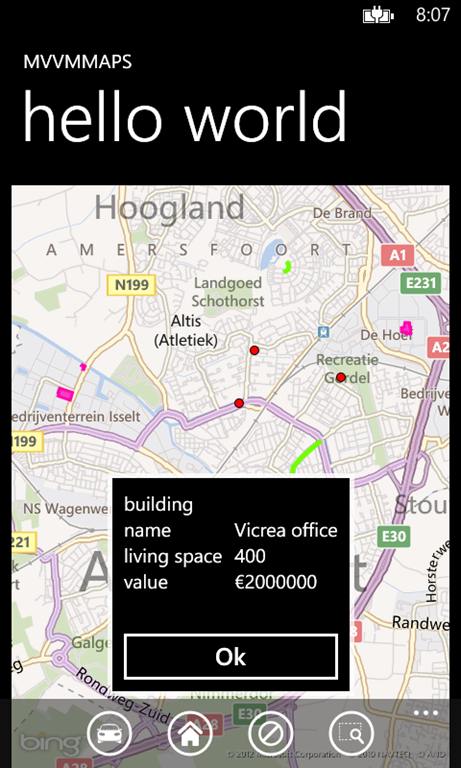 Happy mapping on Windows Phone 8! The time is finally there: the Windows Phone SDK 8.0 is out, and now we can finally talk about all the great news things for developers that this new SDK brings, and I’ll start that right now. And I don’t think it will surprise anyone who knows me that the first thing I did was looking at the much-rumored new maps control. I was not disappointed. In general, just two words: super slick. The very embodiment of fast and fluid. 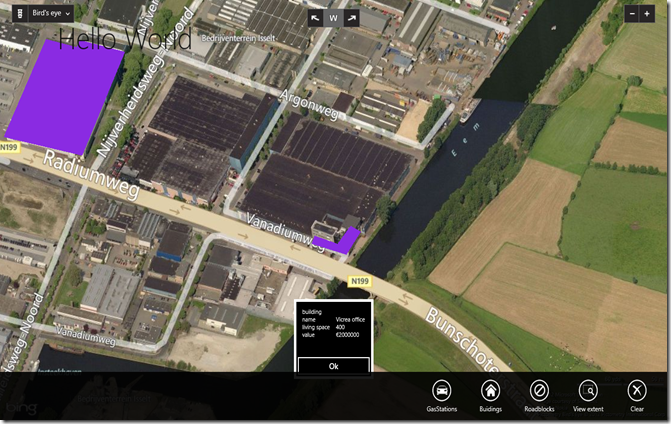 What Windows Phone 8 brings to the mapping table made by geo hart skip and is nothing short of dramatic. Think the Nokia drive map on your Windows Phone 7. On steroids. As a control. For you to use in your apps. With downloadable maps for use offline. I have seen it run on actual hardware and for me as a GIS buff, used to the fact that maps stuff usually take a lot of processing power and doesn’t necessary always go super fast, this was a serious nerdgasm. So I created a little app to show off the very basics of this map control. It allows you to select the various map modes, as well to to select map heading and pitch. Heading is the direction the top of the map is pointing – in Bing Maps this was always “North”, and Pitch is how you are looking on the map. If that’s 0, you are looking straight from above. The new map control stuff in in namespace Microsoft.Phone.Maps.Controls. So “Controls” and “Maps” are swapped. I always keep in mind “maps first” as a mnemonic to remember which namespace to use. Especially when you are using ReSharper or a tool like it that most helpfully offers you to add namespaces and references (again) can really get you caught on the wrong foot, so pay attention. I started out creating a “New Windows Phone App”, selected OS 8.0 (of course), fired up the Library Package Manager and downloaded my wp7nl library. This gives MVVMLight and some other stuff I need for my sample. At the moment of this writing this is still Windows Phone 7 code but this will run fine (of course this all will be updated shortly). The only thing you need to take care of is that you delete the references to Windows Phone Controls.dll and Windows Phone Controls.Maps.dll the package makes. The only important part about this is that there must be an initially selected mode, as the control does not take it very well if the mode is forcibly set to null by the data binding. The map seems to try to keep its heading between 0 and 360 degrees, but I like to have the slider in the middle for North position – that way you can use it to rotate the map left and right. So I want heading to be between –180 and +180, which should be functionally equivalent to between 0 and 360 - and apparently I get away with it. Since both values are doubles I don’t do the standard equals but use a threshold value to fire a PropertyChanged. Courtesy of ReSharper suggesting this. Together with the initial ZoomLevel set to 15, this will give you a nice view of Manhattan Island, New York City, USA. There's also a boolean property "Landmarks" that will enable or disable landmarks - you can look that up in the sources if you like. 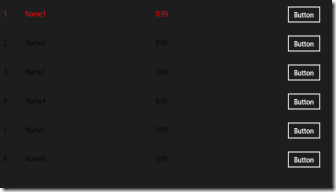 Sue me, I took the easy way out and declared the valid ranges in XAML in stead of in my (view) model. But the point of the latter is this: apparently you can only supply ranges between 0 and 75 for pitch. And the pitch is only effective from about level 7 and higher. If you zoom out further, the map just become orthogonal (i.e. viewed straight from above, as if the pitch is 0). This is actually animated if you zoom out using pinch zoom, a very nice visual effect. If you fire up this application you will get an immediate error message indicating that you have asked for the map but that you have not selected the right capability for this in the manifest. 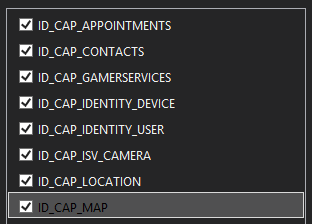 So double click on “Properties/WMAppManifest.xml” and select ID_CAP_MAP (yeah, the manifest’s got a nice editor too now), and fire up your app. And that’s all there is to your first spin with the new Windows Phone map control. It supports data binding – to an extent, and it’s easy to control and embed. Play with the sliders and scroll over the map – it’s amazingly fast and I can assure you it is even more so on actual hardware. Stay tuned: more is coming on this subject! Note: I have not touched upon creating and adding map keys to the map in this solution. This procedure is described here. As usual: download the sample solution here. On the last day of 2011 ago I made DynamicBackgroundBehavior - a quite bizarre behavior which plays a supporting role in my latest Windows Phone application “What’s cooking”. It basically shows a picture from a search string as a background, using Bing Image search. Quite neat. Until Microsoft decided to change the Bing Search API a bit. Up until then, it had been a free unlimited ride – since about August you have to buy a package of searches (anything below 5000 searches per month is free). And some more stuff has been changed. Microsoft provides a nice little C# client library that should solve all of this using an OData protocol. The sad thing is that for the life of it I could not get it to compile on Windows Phone. So I ended up analyzing the PHP (*shudder*) sample in this document – a Word document no less – to see what I needed to do (see page 27 and further). It uses an account key in stead of an App id. The App Id must be send base 64 encoded in the header of the request in stead of in the url as plain text. Windows Phone’s Response.Headers collection does not sport the Add method. That stopped me a little, until I realized you could poke directly a new key in the collection by using [“Autorization”] =. Now the authentication is Basic, followed by a space, your account key, colon, your key again and that key:key sequence needs to base 64 encoded. Why this is implemented this way – no idea, but it gets your key across – and validated. The final thing is that in the callback WebClientOpenReadCompleted I need to use “http://schemas.microsoft.com/ado/2007/08/dataservices” for a namespace,as I already stated. And then my little Windows Phone behavior works again. The fixed version can be downloaded here. I will fix my #wp7nl library on codeplex ASAP. Disclaimer: this is not a 101 article. It requires understanding of the basic idea about MVVM, data binding, the MVVMLight messenger, and the use of behavior in Windows 8 XAML. Let me get this straight: I don’t want you to wean off Windows Phone development – far from it. It’s value proposition is great, and it will become much greater still. This article is yet another way to show you how to carry over code and architecture principles between Microsoft’s great tile based operating systems. It’s all about re-using skills and code. C# and XAML code that is. This would be able to make a line geometry from a viewmodel containing a “Geometry” attribute containing a LocationCollection object, and an ICommand “SelectCommand” that is executed when the user taps the line. Second, you would make a Bing Maps control, and define a layer like this. Basically it comes down to a Geometry view model property that converts a business object geometry to and from something the Bing Maps control understands – a LocationCollection. This is a named collection that contains objects of type GeoCoordinate – your basic Lat/Lon container. As said above, when you tap select the MVVMLight Messenger just sets off the selected viewmodel, and ‘something’ should capture that message and handle it. Now let’s re-use our skills on Windows 8. Simply put – in its current state, the data binding support for the Bing Maps SDK for Windows Store apps is pretty easy to describe with one word – non-existent. Some developers immediately go into the ‘blame-and-flame-the-Microsoft-dev-team’ mode when they encounter things like this. I think ‘CodePlex library’. I always see things like this as an intellectual challenge, a chance to contribute to the community, and fortunately there are more people thinking that way. My very smart fellow Dutch developer community member Dave Smits has created BindableRTMaps, which is very useful for binding point objects – but its shape support is a bit limited. Being a GIS professional and an MVVMLight junkie, I want the control to be able to generate geographical elements directly from view models, just like I was able to do in Windows Phone. I solved the data binding issue for shapes using a Behavior based upon my WinRtBehaviors library. Not quite surprising for those who know me. In the center, next to the river, the Vicrea offices, where I work. Say cheese fellows! ;-) As you can see, the shapes are beautifully re-projected when Birds’ Eye View is selected. This is the stuff that makes a GIS buff tick. There are only two kinds of shapes: MapPolygon and MapPolyline, both descending from MapShape, which in turn descends from DependencyObject – which is very fortunate, as I hope will become clear over the course of this article. So I had the challenge to create something that can be put into XAML to still give the designer an amount of control how things appear, without having to resort to code. 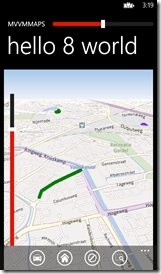 What command in the item view model (in this case, a RoadBlockViewModel) must be fired when a MapShape’s only event – Tap – is called. Which property in the item view model contains the Path – this is the terminology for a MapShape’s collection of points. This is, once again, of type LocationCollection. Only that’s no longer a collection of GeoCoordinate but of Location. Finally, you need to define a drawer. A drawer is a concept I sucked from my own thumb – it determines how a collection of points is supposed to be transformed to something on the map. It’s my way to make something that’s not templatable more or less configurable. The basic drawers don’t do anything with the view model: they just take the settings from XAML. But if you want for instance your shapes having different colors based upon some view model property – say you want to color urban areas based upon their crime rate (what we GIS buffs call a thematic map) – you can write a little custom drawer. The control apparently contains native code, so you cannot build it for Any CPU. For the technically interested I will continue with some gory details. The behavior itself is actually pretty big, so I won’t repeat all code verbatim; I will concentrate on the interesting parts. ShapeTapped checks if it the object sending the event is actually a shape, then tries to retrieve a view model from the attached dependency property, and calls FireViewModelCommand on it. Which basically is directly ripped from my earlier EventToCommandBehavior. And then the circle is round again – user taps, view model command is called (just as Laurent Bugnion’s EventToCommand trigger did for Windows Phone) and the view model takes it further just like before. There’s more to this behavior, but mostly it’s just reacting to events that occur when the ObservableCollection ItemsSource changes. Of course this behavior was geared to make the code I already had as much reusable as possible, but I think the way WinRT XAML apps and Windows Phone apps can be put together are remarkably similar – provided you make good use of MVVM and keep your code as clean as possible. So what did I have to do to move over my business and view model code to get this working? Well not very much, actually. The Gas station view model was changed to do the conversion form business object geometry to Bing Maps’ Location in stead of the converter I originally - because my solution does not support converters. I had to change some name spaces and data types. Mainly GeoCoordinate was now called Location. Oh yeah – in stead of "clr-namespace" I had to use "using" for declaring namespaces in XAML. I used ReSharper toalt-enter trough the errors and add the namespaces almost automatically. Converters and Attached Dependency Properties were carried over with minimal changes. I had to trash my geometry templates and had to write the behavior to emulate the templates – in a way, which admittedly was no small feat. But that’s a hole that only needs to be plugged once, and can now act as a base for possible better solutions. I had to do some fiddling around with the DataTemplateSelector – that works a wee bit different, and will be subject of a future blog post. ‘Tombstoning’ works a bit differently, but quite analogous. Been there, done that, wrote the blogpost. This is still a work in progress, but I think for basic shape data binding this is already very usable. The Bing Maps control is very fast, courtesy of native code, no doubt. I hope this will help people. Once again, for those who don’t feel scrolling all the way up: the source code. Also updated for RTM. Enjoy!